Sometimes we all want to escape the cold, winter weather and imagine ourselves somewhere warm and tropical, maybe even to celebrate our Christmas party. This London Kanaloa Buffet & Drinks Office Christmas Party activity will transport you and your team to a tropical island for a totally unique festive celebration with their exotic décor and delicious, summer cocktails that can even suit the snowy weather! Visiting Kanaloa is an experience in itself, and right in the heart of London it’s really easy to travel to and from for your team, meaning less stress and more focus on the fun evening ahead of them. The tiki inspired furniture and carved masks give you a holiday feel while you’re enjoying a festive feast and some great company to celebrate the end of a hard working year. On arrival, someone will lead you to your reserved area and seating where you can relax for the entire night in between drinking and dancing. Once everyone is comfortable, the festive finger buffet will arrive and everyone can tuck in to a variety of different dishes and flavours, offering a widespread for the whole group to enjoy. The buffet includes some traditional dishes like Christmas dinner on a stick and mini Yorkshire puddings, as well as some more exotic choices like smoked salmon pinwheels and vegetarian options, so there is definitely something for everyone. As well as the main buffet, there will be mini brownies and fruit skewers with dipping sauce, and 2 drinks vouchers per person to enjoy at any point in the evening. With the food polished off and two complimentary drinks to help the Christmas spirit flow, the Kanaloa bar is free for you to explore. Whether you want to stay for a couple of their famous cocktails, or party the night away to some classic commercial tunes, this unique London venue is bound to provide a Christmas party that the whole team will enjoy and remember. 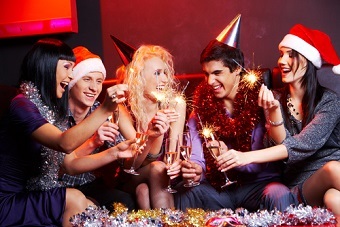 If you want to make your night extra special, add on some mince pies or prosecco before the night and treat your group! Does this London Christmas party activity sound perfect for your unforgettable Christmas night out? If so, give our events planners a call on 0161 34 0052 for any more information or to have the whole evening organised for you, stress free.